At the beginning of our Japanese adventure Maekawa-san gave me two tickets to the temporary exhibition in Kyushu National Museum. The end date had been approaching soon, so I took Jamie and Devon to check it out! We got to the train station early morning, due to misunderstanding losing Devon with no way to contact him… But we caught up with him at the train station in Futsukaichi. From Futsukaichi we managed to get to Dazaifu – as the dad of the trip I picked up 300 pamphlets and had been reading them out loud when we were walking around. Dazaifu was the most beautiful place ever – we started our walk at the old, crowded street full of cool tourist-trap shops. 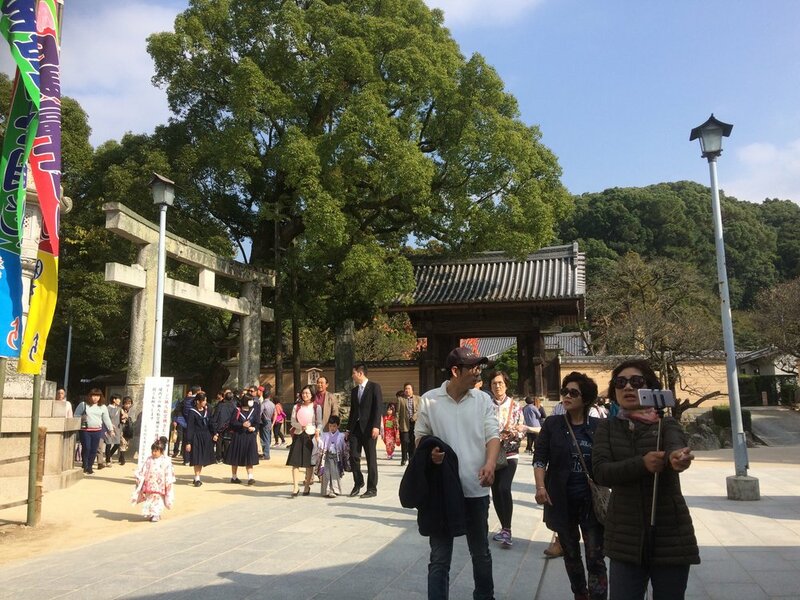 There were buddhist monks standing at the edge of the sidewalk and huge Torii gate near the entrance to the shrine. We wanted check out the museum first, so we moved straight there. It was amazing! Both temporary and permanent exhibitions were interesting and well put together. After exploring we went to eat something – we found a little not too expensive traditional restaurant. After filling our tum-tums (also with famous Dazaifu mochi!) we went around the temples and shrines. I was tired at the end of the day but oh so so so happy we went there. I kind of want to visit there again, as it’s only 2h journey one way, and being there made me so, so, so happy.